A new site for us. It kept cropping up over the years but we have always been put off by reviews of the toilet and shower (singular)! However, recent reviews are full of praise for the new facilities block, so we thought we would give it a go. It's main attraction is its nearness to Skipton and Malham Cove. A week off work for D so a Sunday start. We arrived just before 1pm and parked in the touring section, then walked up a hill to reception to find out what pitch we were on. Number 13! Uh oh. It was actually quite a good pitch overlooking fields, albeit a bit shady. The touring section is 15 pitches near the entrance to the site, about half of which appeared to be seasonal and were unoccupied while we were there. Probably quite a hard site to get into at weekends. The main reason for coming here was to see what Skipton pubs have to offer, so we headed into town after a quick lunch. Had a quick look around the town and shops before a drink in The Boathouse, The Narrowboat, The Woolly Sheep,The Fleece, The Black Horse and The Yorkshire Rose. £5 for a taxi back to the site. A good night. Best pub? We liked The Boathouse because it is right on the canal and had a good selection of local beers. The Narrowboat and the Woolly Sheep were nice too. 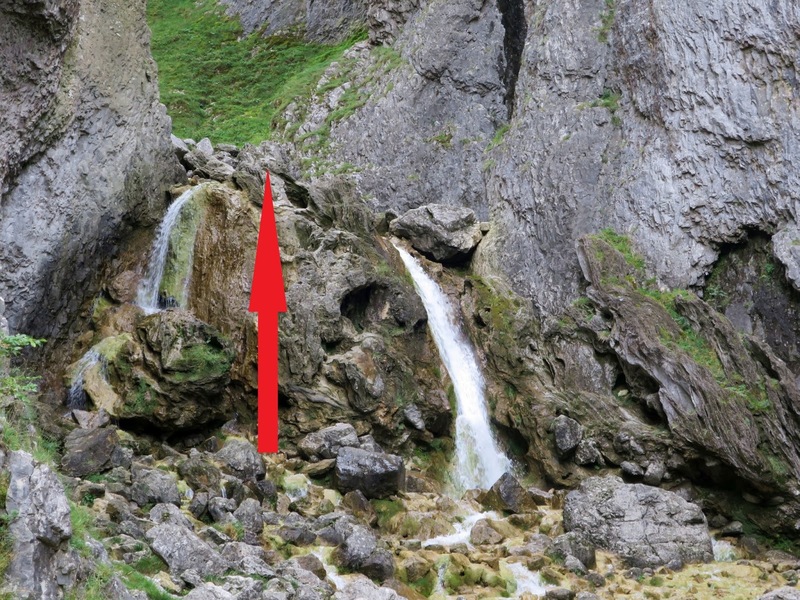 A longish walk (for us) to Malham Cove, via Janet's Foss waterfall, Gordale Scar and Malham tarn. Quite a cloudy day, but just about perfect for walking. 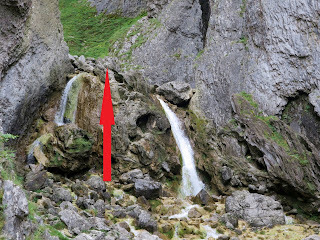 J is still recovering from falling off her bike a few weeks ago and didn't fancy scrambling up the waterfall (see route below)! So we retraced our steps and found an easier way to the top. We watched another couple scramble to the top, so it is possible, but most people just turned around, like us. 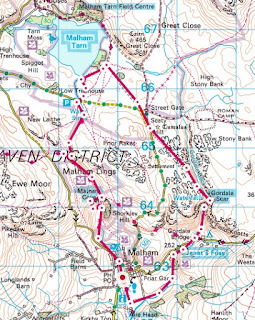 Had tea and cake in a cafe in Malham. J didn't enjoy her Yorkshire curd tart and left most of it, but D enjoyed his bakewell slice. Back at site we thought about having a barbecue, but our pitch was very shady we thought it would be just a bit too cold so we cooked the barbecue food inside the caravan. Then it was back to Skipton for drinks in The Boathouse and The Woolly Sheep. We didn't rush, but still ended up leaving about 10.30. We liked Tarn House and will be back when we want to visit Skipton again...if we can get in! A day or two at home, then we will be away again, although nothing booked yet. The weather forecast for Saturday is not looking good!